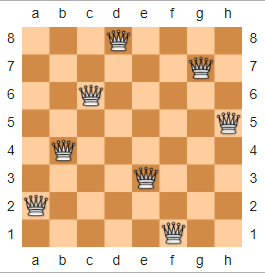 In chess, the N-Queens Puzzle is described as follows: Given an n x n chessboard and n queens, arrange the queens onto the chessboard so that no two queens are threatening each other. Below is an example solution for n = 8, borrowed from Wikipedia. The challenge here will be to take input n and output an ASCII representation of a solution to the n-Queens puzzle. Since there are more than one possible solution (e.g., at the least, a rotation or reflection), your code only needs to output any valid solution. The resulting ASCII representation of a solution to the N-queens puzzle, as outlined above. You may choose any two distinct ASCII values to represent blank spaces and queens. Again, this can be output in any suitable format (single string, a list of strings, a character array, etc.). Leading or trailing newlines or whitespace are all optional, as well as whitespace between characters, so long as the characters themselves line up correctly. You can either use an algorithm to calculate the possible positions, or use the explicit "stair-step" style of solution, whichever is golfier for your code. Either a full program or a function are acceptable. If a function, you can return the output rather than printing it. If possible, please include a link to an online testing environment so other people can try out your code! This is code-golf so all usual golfing rules apply, and the shortest code (in bytes) wins. The obtained solution is random. If you run the code again you may get a different valid configuration. Running time is also random, but the longest test case (n = 10) finishes in about 30 seconds in TIO most of the time. Directly prints a solution in O(1) time. Return a 2D-array. It takes 2.76s to calculate f and 135s for f. (In the current version, - becomes 0 and Q to 1. The algorithm is similar to MATL answer but here the code is completely brute-force. The code is not mine, but from the IOCCC. I hope I'm not breaking any rules. Also, this displays all solutions for N between 4 and 99. I'll try to get a TIO link later. Assuming each queen are placed on separate rows, we only need to find the column indices to place each queen at to avoid conflicts, which can be found by generating a random permutation of [1, 2, ..., n] and testing it. Brute force search through all permutations. I could remove the * and print the list comprehensions, but they look awful. Q . . . . . . . . .
. . Q . . . . . . .
. . . . . Q . . . .
. . . . . . . Q . .
. . . . Q . . . . .
. . . . . . . . Q .
. Q . . . . . . . .
. . . Q . . . . . .
. . . . . . Q . . . This is more or less based on the C solution by orlp. Start the main loop, iterating r, the row number, from q down to 0, decrementing at the start of the loop, so the first r is q minus 1. Output offset space characters to indent the queen's position for the current row, plus one additional space just because it makes the output loop easier. Output the Q for the queen, followed by a newline to move to the next row. Test if r is zero, in which case we've reached the end of the board and can exit, otherwise we repeat the main loop again. Convert to unary, using spaces (there is a space after the *). Create N rows with N spaces, a ;, then 0..N-1 spaces, then a Q. The remaining stages apply to all rows. If the loop index equals N/2*2, then just leave that many spaces. If N/2 is a multiple of 3, then take double the loop index plus one, modulo N/2*2+1. Otherwise, take double the loop index plus (N/2-1) plus an extra 3 in the bottom half of the board, modulo N/2*2. Actually perform the modulo operation. Try it online! Link is to verbose version of code. Another port of @orlp's excellent C answer. Full program prompting for n from stdin. Prints space-separated solution to stdout using · for empty squares and ⍟ for Queens. Brute force by testing all permutations of length n.
Not the answer you're looking for? 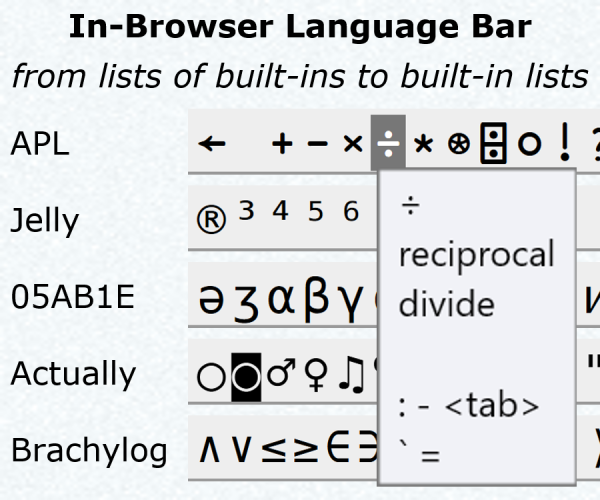 Browse other questions tagged code-golf ascii-art chess or ask your own question. How many Wazirs can be placed on an N×N Chessboard? How many squares are guarded by chess queens?